Where to Play Wolverine for Real Money? Enter into the exciting Marvel world when you play Wolverine, a great slot based on one of the most popular comic book characters around. The theme of this slot is one that stays faithful to the original comic series, so you won’t see Hugh Jackman at this slot: instead, you’ll find fantastically drawn graphics that even Stan Lee would be proud of, which should excite both comic book fans and slot fans alike. The fact that this game is quite heavy on graphics can cause it to run slightly slowly though, so it is only recommended to those with a decent internet connection – slower connections will find that the game takes a while to load. You’ll find many great symbols on this slot, all of which will make complete sense to fans of the comic book series. What’s more, the character of Wolverine is also seen menacingly standing next to the reels, ready to react when you spin in a winning combination – or to look bored when you take too long spinning the reels. The great attention to detail found at this slot’s theme means that all slots players should really enjoy playing Wolverine, even if they aren’t too familiar with his character, either on screen or in comic books. 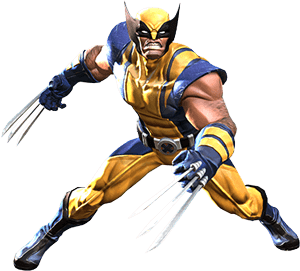 How to Play Wolverine Casino Game? The gameplay at Wolverine really couldn’t be simpler, meaning that anyone who has ever played a slot before will be able to immediately start playing this one. There are 25 paylines at the slot, however they are all fixed, meaning that you can’t choose how many of them you’d like to play. You can choose the amount you want to bet per payline though, which ensures that both low and high stakes players are catered for. Those who want to get through loads of spins can also choose to use the Autoplay feature, while the Turbo feature quickens the game to even higher levels. Once the stakes have been decided, it’s simply a question of getting the reels spinning. If you’ve selected the Turbo feature, you’ll find the results of the spins before the reels have stopped, however normal play means waiting a few seconds more to see if you’ve won. Unlike some slots, there is no gamble feature found at Wolverine, meaning that you won’t have the chance to increase your prizes even more – and that there’s also no chance of you losing your prize either. So, the gameplay at Wolverine really is simple, but that’s exactly what most slot players want to see. Wolverine is a slot with many fantastic features, however perhaps the biggest of these are the progressive jackpots it offers. All Marvel slots are linked to the same set of progressive jackpots, and these grow the more the games are played. The result? The jackpots can grow to huge levels, before resetting when a lucky player wins one of them. Winning the progressive jackpot is done via a random bonus game, which can be awarded after any spin. There’s a better chance of the game being unlocked when playing at higher stakes though. There are also some other great features to mention at Wolverine, with the first of these being the stacked wilds. These can cover an entire reel, and substitute for most of the other symbols on the reels. As you can imagine, this can lead to some particularly large prizes. Then there are the free spins, which are unlocked by getting three or more syringes anywhere on the reels. These aren’t normal free spins though, as getting more syringes will lead to the Adamantium level increasing, which in turn will allow wild symbols to be frozen in place. This can mean that some spins will have absolutely loads of wild symbols attached to them. The final feature to mention is called the Berserker Rage feature, and it is activated by getting the Berserker Rage symbol anywhere on the fifth reel. If it appears on the top, you’ll receive up to four wild symbols on the reels, all positioned next to each other; if it appears in the middle, you’ll get up to five wild symbols anywhere on the reels; and if it appears on the bottom, you’ll get two sets of stacked wilds on the reels.